The world’s last known female Yangtze giant softshell turtle died just 24 hours after a failed fifth attempt at artificial insemination in a bid to save her species, reports China Daily. Believed to be more than 90 years old, Xiangxiang is one of the last four known turtles of her species in the world. 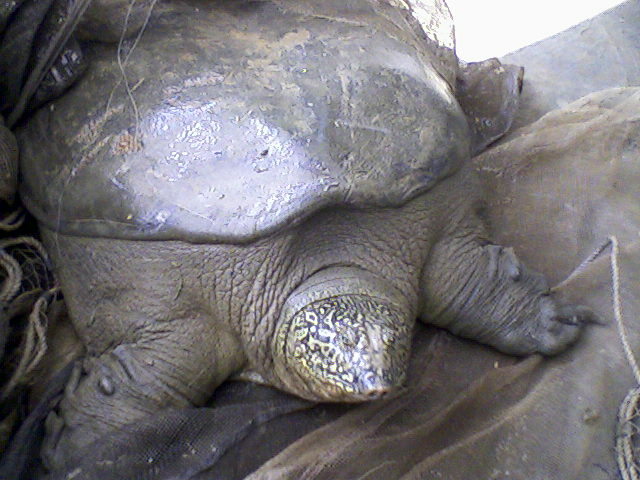 She leaves behind a male Yangtze turtle over a century old in China and two other unsexed turtles living in the wild outside of Hanoi, Vietnam. Her death leaves the species functionally extinct – the population no longer viable – unless another female is found in the wild. The male and female turtles were brought together at China’s Suzhou Zoo in 2008, where veterinarians and conservationists had hoped they would breed. The two were believed to be healthy enough for the procedure and similar anesthesia methods were performed in the past without incident, according to the Wildlife Conservation Society (WCS). After she failed to recover from anesthesia, researchers reportedly spent “24 hours of nonstop emergency care” trying to revive the turtle following her Friday procedure. The male recovered from his procedure without incident. The species, Rafetus swinhoei, is listed as critically endangered by the International Union for Conservation of Nature Red List of Species and is endemic only to parts of China and northern Vietnam. Major threats to the species include overfishing and harvesting of aquatic resources, as well as pollution from agricultural, domestic, and industrial runoff. Though there has been a limited number of Yangtze turtles observed, it’s believed that most measure over 1 meter (3.5 feet) in length and can weigh up to 100 kilograms (220 pounds). Officials have preserved ovarian tissue for potential future work. It’s hoped that scientists can work with China and Vietnam to potentially determine the genders of the two wild turtles. A necropsy will be performed in order to determine what went wrong.